Use McCormick Barbecue Spice for grilling, barbecue and anytime seasoning, McCormick Barbecue Spice is designed to impart a hot and spicy character. BBQ Spice is hot to the taste and has a spicy, pungent aroma. Nutmeg, cloves, and coriander give the blend a pungent earthiness and rich aroma as well as color. Barbecue Spice has a peppery profile as well as a rich, red-orange color. McCormick Barbecue Spice can be sprinkled on meats, poultry, seafood, or vegetables prior to cooking. Sprinkle Barbecue Spice on cottage cheese, sliced tomatoes, hash brown potatoes, or hot buttered popcorn. 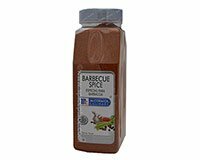 Add BBQ Spice to marinades and sauces as well as to salad dressings, chili, stews, soups, gravy, hamburger, or meat loaf mixtures. Toss McCormick Barbecue Spice with shredded cheese to top casseroles, vegetables, or split loaves of bread. Add Barbecue Spice to corn, potatoes, squash and Lima beans. For a quick barbecue sauce, add 1 tsp Barbecue Spice to 1/2 cup ketchup, 3 tbsp brown sugar and 1 tbsp water. Ingredients: Spices (Including Celery Seed, Coriander, Black Pepper and Red Pepper), Paprika, Salt, Onion, Garlic and Silicon Dioxide (Added To Make Free Flowing).